Transhield - The Shrinkable FabricTM for Superior Storage Protection, with patented VCI (Vapor Corrosion Inhibitor). Custom-fit covers with zippers, Velcro or other components make use simple. Non-abrasive non-woven lining protects finishes from damage. Inner non-woven lining reduces condensation associated with typical film. Stand-alone product - no bubble wrap, micro-foam, or any other product is needed. The heat shrinking process provides a tight fit so that the cover will stay on during transportation or storage. Easy to apply in just a few minutes. Transhield offers 100% protection as opposed to spot protection. Transhield can be removed quickly and easily. 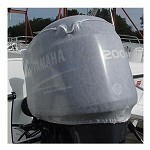 NOTE: Currently, Transhield Boat Covers eliminate the sizing process required for Shrink Wrapping. Please allow a couple business days for processing Transhield orders. To save time, your new Transhield cover will ship by UPS or FedEx, direct to you from Transhield Inc in Weslaco, Texas.